Have an authentic designer handbag, watch or jewellery item you would like to sell? We would love to work with you! Selling an item is easy, fast and confidential. No consignment necessary - Instantly sell your designer items! Selling your handbag, watch, jewellery or other accessories with Modaselle is fast, easy and confidential! We want to showcase your items in our store and pay competitive rates to get it. 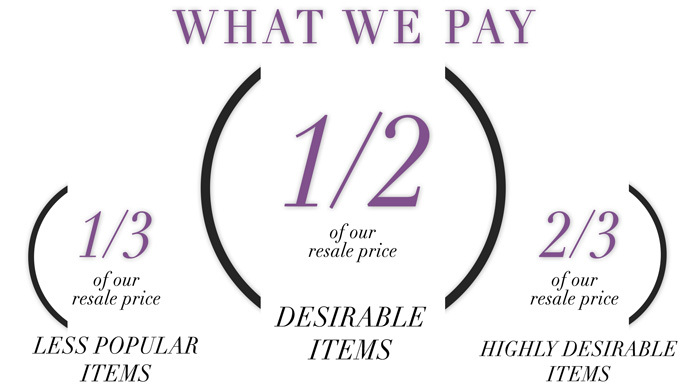 Our payments generally range anywhere from 1/3 to 2/3 of our resale price depending on the item’s demand and condition. Modaselle does not offer consignment and we buy all of our items outright. For a free evaluation, bring your item to our Vancouver store located at 943 Seymour Street, Vancouver BC V6B 3M1. Please note - at this time we are not able to provide quotes through our website. If you are unable to bring your item to our Vancouver store, please contact us for more information. We at Modaselle take authenticity of all items very seriously and we only deal in authentic merchandise. Every item that comes through our store is inspected by multiple experts that specialize in authenticating that particular brand. If there is any doubt on the item’s authenticity, we do not buy it. If we discover a seller deliberately tries to deceive us and sell counterfeit goods we will ban that seller from being able to sell any additional items to us. For more information please visit our Authenticity page. Remember! Having original boxes, dust bags and authenticity tags can increase the demand and price we can pay for your item so make sure to include all of those details in the description. The more information you provide to us the easier it will be for us to get you a great price.